The new Bertsche X-Flex FMS replaces three machining centers and handles all expectations for a manufacturer supplying large components for an aircraft OEM. The Bertsche X-Flex FMS is a very large machine but a thoroughly flexible operation: it has two different work zones and multiple design adaptations that allow the aircraft supplier to produce short-notice critical parts with zero tolerance for error, or delay. Production problems occur in all sizes and trying to meet the challenge of making one size fit all requires a better idea, a better solution — and that’s how one customer’s problem became an opportunity for Bertsche Engineering Corp. It began as a simple customer request: Every day, a Tier 1 manufacturer of large airplane structural assemblies is required to modify semi-finished and partially assembled detail parts for large airplane structural assemblies. In addition, the parts are needed just prior to final assembly, so this manufacturer wanted an all-purpose machine that could be set up quickly to run a wide range of parts, in support of several different airplane programs. To appreciate this problem, it helps to understand the difficult work environment: Airplane manufacturers often start to produce parts for a specific airplane order well before all detail parts for that airplane have been fully defined. This is great for the airlines but complicates the process of building planes to a tight schedule. Furthermore, airplane manufacturers must have considerable flexibility built into their processes, to allow last-minute modification to parts that will be needed shortly thereafter in final assembly. In these circumstances, the manufacturer needs to have the ability, as required, to modify or rework every detail part needed for a specific structural assembly. On short notice, CNC part programs must be created for virtually every part used in that subassembly, while special tools and fixtures need to be readily available and easily set-up in machines, so that the parts can be manufactured just-in-time before they are needed at assembly. This is “one off” manufacturing in the truest sense, where the first part must be a good part with no margin for error. For Bertsche — a designer and manufacturer of standard and custom 3-, 4- and 5-axis CNC machine tools; high-pressure water deburring machines; and automatic tool storage and retrieval systems — the customer’s initial request was simple: replace three small footprint machining centers with a single machine tool that could be reconfigured quickly with tools, workholding fixtures and programs to manufacture the parts needed to complete a specific airplane build set. Specialized workholding, developed over many years for older model, planes had to fit onto the new machine, and workholding was needed for the latest model airplanes. Set-up time needed to be in minutes (or at most, hours), not days. The customer wanted to reduce operating costs by reducing the number of people needed to run the machines, reduce set-up time and improve the productivity. The existing machines could only manufacture small parts fitting a 20×30-in. work envelope, but the new machine had to handle these parts plus parts as long as 240 in. There was neither budget nor floor space to replace the existing machining centers with new ones and purchase a new long X-travel machining center. Having developed a long X-travel, raised-carriage, fixed bed machining center (Xi-Mill) for single- or dual-work zone long-part machining, Bertsche’s solution was to expand the capabilities of the existing machine design by developing a new type of machine. The new X-Flex Center is configured with multiple pallet receivers instead of the typical T-slot tables. This allows the customer to load multiple workholding fixtures into the machine and have them ready to run on short notice. Equipped with a set-up changer, the machine can be reconfigured quickly by pulling new workholding fixtures from storage and loading them into the machine to match constantly changing production requirements and schedule changes. Having the dual-work zone feature, with each work zone having its own dedicated tool changer, the operator was able to load newly tooled fixtures in one zone, while parts were being machined in the other. In keeping with lean operating principles, this solution is an FMS that does not require all the automation, expense and overhead to manage. The machine is easy to oversee, pragmatic, and affordable, and it allows the manufacturer to produce a wide range of parts with just a single machine. As the project unfolded though, many new requirements were adopted, diverging from the original “as conceived” solution. 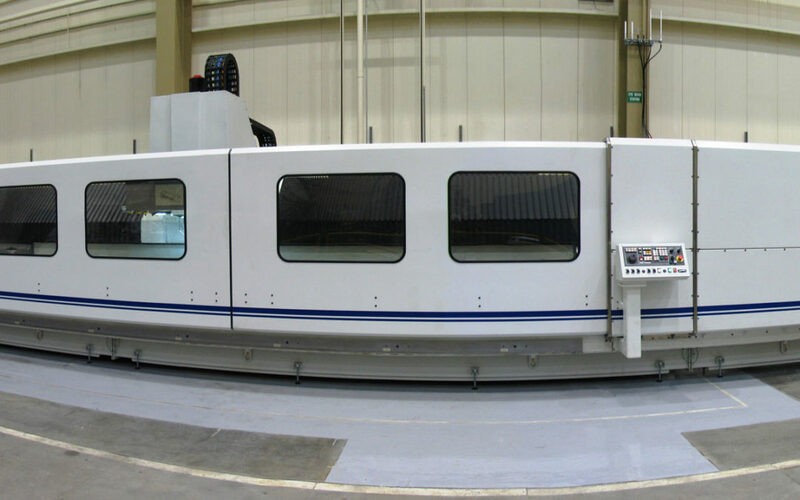 Long parts, short parts, 4-axis machining, smart fixture control, automatic fixture recognition, integral thermal growth compensation, video camera for actual cutting display, different materials, aluminum, titanium, composite (CFRP) parts, sandwich materials, materials separation, special water filtration, materials separation and other considerations arose, with each requirement mandating additional machine functionality. To machine the long parts, the design called for two T-slot tables, one for each work zone and the two used together for very long parts up to 240 in. It needed a fourth axis, trunnion-style table, designed to accept smart fixtures up to 72 in. long, fixtures with retractable clamps controlled by the part program. The machine tables needed to be reconfigured from T-slot mode, to 4-axis trunnion mode, to pallet mode and back again. To address these requirements, a zero-point clamping system was incorporated into the base table. This allows the pallet receivers to be decked with various long-part handling special tables. The zero-point clamping features mean that different tables can be installed quickly, with a high degree of repeatability (0.0002-in. repeatability for a 120-in. long table). Large and heavy special tables could be craned overhead, lowered into place, clamped and locked down to do production-ready machining in minutes. For further flexibility, a vacuum workholding system was added to allow any of the pallet receivers to use both mechanical and vacuum workholding. Each work zone is equipped with a CNC part program addressable connection port, so that special fixtures with complex part clamping (part program actuated) can be controlled by the programmer. Being a very large machine with two different work zones, and machining parts that are used in final airplane assembly just 24 hours later, means there is zero tolerance for error or delay. A video camera view port has been provided to allow the operator to see what happens in one work zone, while the other zone is set-up for the next part. A further complication emerged later: Constantly changing and reconfiguring the worktables with different workholding fixtures means that the system is prone to operator error. To address this, a radio frequency identification system (RFID) read/write station was incorporated into each pallet receiver location. By reading the tooled fixture pallet tag, it is possible to compare the “workholding fixture” installed in a given pallet location to the part program pulled down to the CNC. This ensures that the program, part, and tool match. And, the same system is used to scan the tools in the tool changer and can be used to verify the correct tools were available to machine the selected part before the actual machining cycle began. Switching from aluminum parts to CFRP composite parts required a chip and water filtration system to convey both chips and sludge-like material. The waste material must to be separated from the coolant. First, the chips from composite sludge, then the coolant-suspended CFRP fines, are filtered from the coolant. Material separation and disposal are not just an operational issue but rather a facility and hazardous waste disposal issue. The machine is equipped with a flush-and-wash feature that allows the entire work zone to be washed down and cleaned before the next material was machined. For chip collection and removal, a conventional chip conveyor transports chips out of the machining area. The chips are separated and put into a dumpster. The cutting fluid carrying liquid and suspended composite particles are pumped to a cyclonic separator, where the sludge is separated and fleece paper filtered for separate disposal. For long part machining, “hole pattern” to “hole pattern” accuracy is critical and thermal growth of the part relative to the machine was factored into the design. Knowing the temperature of the part (so that appropriate length compensation could be applied) was critical when parts needed to snap together at assembly. To this end, each work zone was equipped with a material sample station. A sample piece of the material was mounted, its temperature measured and the information fed to the CNC for corresponding machining thermal positioning adjustment. To interface with the shop-floor managing network, a front-end PC equipped with bar code reader allows the operator to scan in work-order information and, together with pallet loading instructions, send the right program for the part(s) to be manufactured as needed to meet daily production requirements. The operator loads pallets loaded with workholding tools, as directed, to a specific pallet receiver location, while the system verifies that the correct tools are available in each tool changer. Then, the operator can arm the work zone in which machining takes place next take and wait until the part(s) in the other zone are manufactured. The process repeats throughout the day with nearly 100% spindle and operator utilization in a “one off” demand-driven environment. To ensure the correct tools of size and length are used, each ATC is equipped with its own tool length setter. Each tool can be measured, with offsets adjusted prior to machining. A spindle probe, one for each work zone, allows fixtures and parts to be probed for location with corresponding work coordinate adjustments. A special marking tool allows information to be written on a part in easily readable script.